This recipe, baked last Wednesday, is responsible for my all-salad diet last Thursday. I found them so irresistibly good, that I couldn’t help but break off a piece of scone every time I walked past the cooling rack. Pretty soon, I had quite a few down the hatch. And see that glaze pooled up under the rack of scones? Yep, I slurped that up, too. Seriously. That good. The scones are part cookie, I suppose you could say. I’ve combined the goodness of my mom’s chocolate chip cookies, in all their brown sugar and chocolate chip goodness, with just the most perfect partner. Peanut butter. In the form of a luscious glaze that I borrowed from one of my favorite recipes of Maria’s from Two Peas & Their Pod. Her Peanut Butter Apple Bars are one of my family’s favorite treats, and we’ve gotten quite a few of our friends and family hooked on them as well. They always disappear in record time. 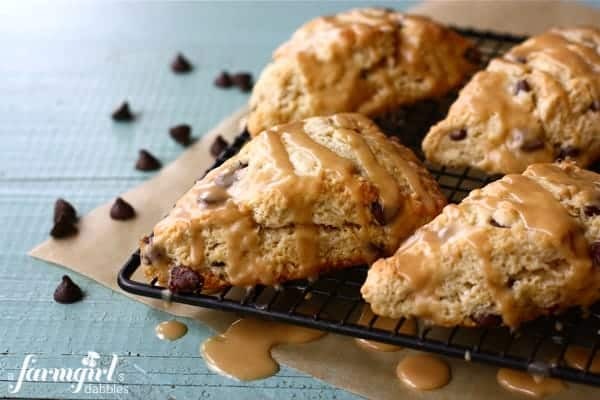 These Chocolate Chip Scones with Peanut Butter Glaze are light and tender on the inside, with the most beautiful thin outer crust. Sweetened just a bit with brown sugar and then drizzled with a sweeter peanut butter yum, they are a little wedge of heaven. When you make them, you’ll see exactly what I’m talking about. And I dare you to walk past that pooled up peanut butter glaze without swiping some into your own mouth. Resistance is utterly futile. Preheat oven to 425°. Line a baking sheet with parchment paper. In a bowl, stir together flour, brown sugar, baking powder, baking soda, and salt. With a pastry blender or two knives, cut in butter until mixture resembles coarse meal. Stir in chocolate chips. Make a well in the center and add buttermilk, egg, and vanilla. Stir just until combined, taking care to not overmix. Transfer dough to a lightly floured work surface and knead 5 or 6 times. Pat into an 8” circle and cut into 8 wedges. Transfer to prepared baking sheet, about 1-1/2” apart. Brush each wedge of dough lightly with milk. Then bake until scones are golden brown, 12 to 15 minutes. Let cool on pan for 5 minutes before removing to a wire rack to cool completely. After removing the scones from the oven, prepare the glaze. In a small bowl, whisk together all glaze ingredients until smooth. 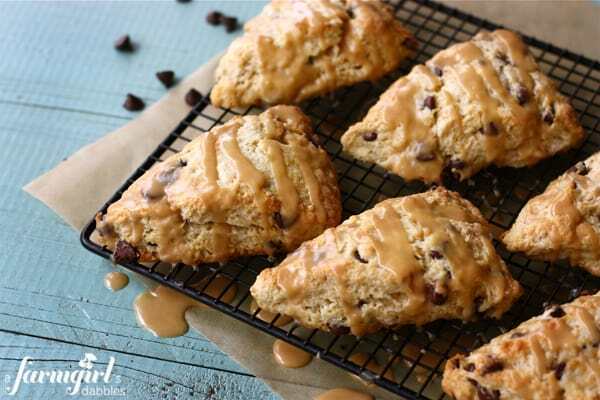 When the scones are mostly cooled (they can be slightly warm yet), drizzle the peanut butter glaze over the scones. I believe scones are always best the day they are baked. But this recipe does allow for some advance prep. 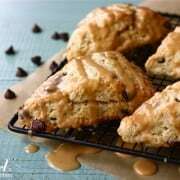 The unbaked dough freezes really well, enabling you to store the unbaked scones in your freezer and bake them up fresh when desired. Just cut the dough into wedges, place them on a tray in the freezer for an hour and then transfer the frozen wedges to a plastic freezer bag. On the day you want to bake them, take them directly from freezer to baking sheet lined with parchment paper (do not thaw first) and brush with milk. You will need to bake the frozen dough a bit longer, adding about 4 or 5 minutes onto the regular baking time. Scones heavily adapted from Everyday Food by Martha Stewart, originally from Letty Hampton of Oxford, MI. Peanut butter glaze adapted from Two Peas & Their Pod’s recipe for Peanut Butter Apple Bars (one of my family’s favorite treats! ).